If you’ve been wishing for a print magazine that would cover cool up-and-coming country artists right beside the big names, and not just focus on the here and now but take the time to look back on the past greats of the genre, well you may just have received your wish. From the same people that have been publishing England’s high quality and highly-circulated Classic Rock Magazine since 1998 comes Country Music Magazine presented by Classic Rock, with the inaugural issue being released September 11th. 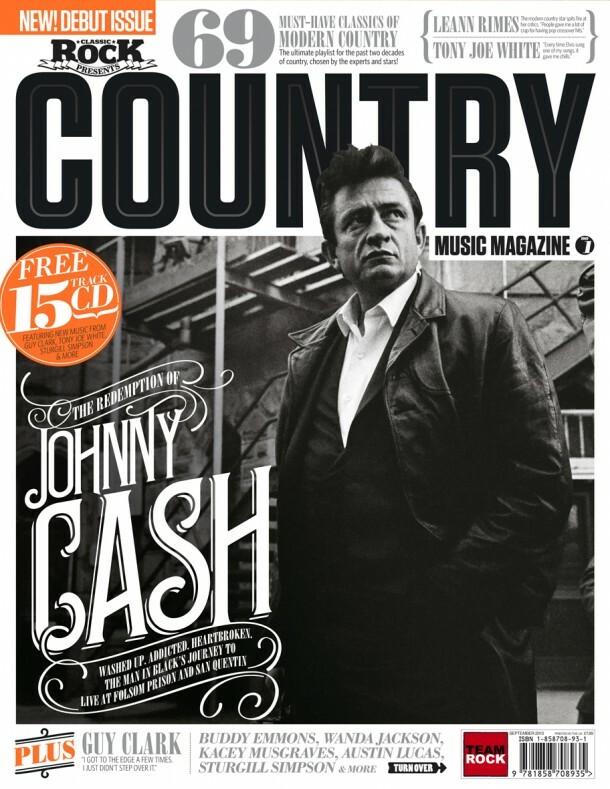 The first issue features a cover story on Johnny Cash and how he fought back from depression and drug addiction to release his two greatest albums At Folsom Prison and At San Quentin. The issues also includes features on Leann Rimes and her new album Spitfire, Kacey Musgraves, Guy Clark, Steve Martin and Edie Brickell, Wanda Jackson, Tony Joe White, and an exclusive interview with pedal steel guitar legend Buddy Emmons. And best of all, right beside these big names are features on Sturgill Simpson, Austin Lucas, Fifth on the Floor, UK’s My Darling Clementine, Case Hardin, Carrie Rodriguez, and more. UK-based or not, its hard to look at this first issue and accuse them of not knowing their way around country music. The 132-page magazine will also feature a free 15-song CD of the artists it included in each issue. “The magazine will feature the best writers, photographers, and will document Americana and roots music at its coolest,” says Country Music Magazine Editor, Ed Mitchell. “If it twangs, whines or breaks your heart, it’ll be in the pages of Country Music Magazine”. There will also be a two hour, weekly radio show that will launch on Sunday September 8th on TeamRock Digital One radio. Hosted by Rob Hughes, who has a wealth of experience presenting country on 6Music as well as contributing to the magazine’s Johnny Cash cover story. The shows content will largely reflect the content of the magazine, playing the songs by the artists interviewed each quarter. Once again, leave it to European-based organization to take up the slack where the American market has lapsed in covering its own indigenous art forms. As Country Music Magazine is proving, the appeal for true country music from the past and present is international, and deserves more attention. And who knows, you may see some contributions from some of your favorite country music writers you’re already familiar with 😉 . 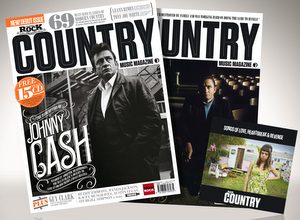 Country Music Magazine can be pre-ordered now for £9.99 (roughly $15 US). Stay tuned for more info about US availability and distribution. Looks good, especially since the brilliant ‘My Darling Clementine’ are featured on the CD. In the UK (not just England !! ), we have Maverick magazine, which is good. I’ll give this a try and see how it is. i wish it was mojo or uncut putting out a country mag but most of the british music mags are way better than the crap we get here. Except NME. It used to be awesome back in the ’70s and ’80s. Great artists they cover. A nice balance of more known acts and the smaller ones. Will be buying this. And great cover design as well! Love this, great how they focus on true country artists, new and old. The free CD is an awesome way to promote the magazine and artists at the same time. Nice, I’ll definitely invest in a copy. Besides Maverick, we also have Country Music People over here. It recently celebrated its 40th anniversary: well worth a look! And now that My Darling Clementine has been mentioned, I can certainly recommend their new album “The Reconcilliation?”. It’s a superb collection of original songs and probably the best UK country album since Brian Hughes & the Lonesharks “My Kind of Paradise” from a few years back. Nice! Can you use your connections to get them to open a chapter on this side of the pond? AND, they have an article about Tony Joe White! Six guns up, in my book! The names listed in the orange circle are different in the two pictures. Four of the five names are mentioned in this article. Weird. I believe that picture at the top was an older version. I’ve since swapped it for another image the magazine sent me. I don’t have a track list yet for the CD, but I think it’s safe to say most of the names listed to appear in the mag will be included on it. This is how it starts good press for the good side of things. Hope this helps turn the corner and gets some of the POSERS on the run. All good things lately seems like we are gaining a little more ground. Long way to go but well on the way. How do we get a subscription of this in the States? When I tried to preorder it appears it’s only shipped to UK addresses. Hi my name is Mike I see the county magazine is on it’s way back that a good thing . Ok I have a large collection if county rock blues jazz new county and all in between all mint And in sleavs along with music books cadloges guitars cadloges quit a nice large collection of music may you would be interested let me know and all send you some picks I got books on thoes to !! !